Looking for something to do with those overripe bananas just sitting on your counter top?? Whatever you do, do NOT throw them out! They are perfect for smoothies, pancakes, but more importantly, muffins! Well here is a very simple and moist muffin recipe, that my children just adore! Oh yeah, and it just happens to be gluten free. 2. Whisk together wet ingredients in a separate bowl. 3. Add dry to wet, until incorporated, fold in nuts. 4. Bake at 325 for 25 to 30 minutes. these are probably my favorite muffins ever, gluten free or not. they texture and moisture is perfect, the flavor is phenomenal and, most impressively, i don’t feel sick after eating one (two…? three….?). i love to throw some chocolate chips in there, too, as a dessert-for-breakfast treat. These are so good – I have been searching for a great gluten free banana muffin that both my kids and I like – took these camping and had to fight to save some for my breakfast – everyone on the trip loved them. I added GF extra dark choc chips and they were awesome. I have made a couple other recipes – I cannot have dairy and have used Earth Balance buttery sticks in your recipes with great success. So glad you and your family enjoyed them! It’s funny because I have to hide things from my kids all the time, or they will be gone right out of the oven! Thanks for letting us know that Earth Balance has worked as a butter substitute for you. I appreciate the feedback. Take care! Loved this recipe!! I made it as banana bread (takes about 55 minutes to bake), and my grain eating family loved it. Finally grain free recipes from someone who remembers what food is supposed to taste like!! Would these work by replacing the almond and coconut flour for a gluten free flour? Have certainly made my grain free life a lot tastier!!! Thanks for this great recipe. 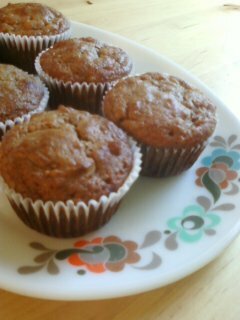 I made these muffins for the first time last night, and they are just sweet enough and the texture is very nice. I added the walnuts and that really added to the flavor. I will be making these again. I made these yesterday – and even though I messed up the recipe – they were still great. I purposely halved the amount of honey, but completely forgot to add the butter. They didn’t rise at all, but oh they taste great! This morning I ate them with hazelnut butter (the kind that has hazelnuts as the first ingredient) and it was amazing! Best thing I’ve eaten in a while! Just discovered your blog today, and so, so happy!!! Thank you so much for posting all this simple gluten free recipes. I am just trying out the gluten free way to see if it helps me and so glad to see that gluten free can be simple too. I replaced the almond flour (didn’t have it) with garbanzo beans flour and it worked great. Yummy!!! Hi Michelle! Thank you for all you do to bring delicious food to my table! My story is similar to yours as I was diagnosed with Crohns during my first pregnancy. That was almost 8 years ago and after many steroids and immunosuppressant drugs I can say that through the SCD and now Paleo I am in remission and no longer on any meds! It’s amazing what food can heal. Now, onto these muffins! AMAZING!!! These really are the best muffins I have had, including those made with gluten. I have directed countless people to your site after they have exclaimed in pure amazement, “These taste like heaven!”. My kids eat them in their school lunches and as a snack after school. Thank you for making this diet so much tastier! I know this might sound like a stupid question, but what size bananas do you use? Do you know how many cups of mashed bananas the recipe calls for? I have made these several times and they are delicious! Very moist and taste like banana bread. The last time I made them I used cashew meal from Trader Joe’s instead of almond flour and they turned out great! You could not tell the difference.